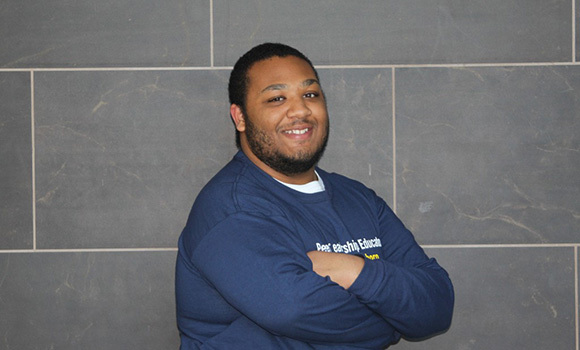 Terrell Saunders was recently named UNCG's first Newman Civic Fellow. Fighting homelessness and hunger is no small task. But armed with a Newman Civic Fellowship, UNC Greensboro’s Terrell Saunders is up for the challenge. Chancellor Franklin D. Gilliam, Jr. nominated Saunders, who has shown potential for public leadership. Saunders is the first Spartan student to ever receive this fellowship. The Newman Civic Fellowship program recognizes students like Saunders who have demonstrated an investment in finding solutions for challenges communities face throughout the country. The fellowship provides resources and training to help nurture students’ passions in developing these solutions for social change. Saunders, a junior double majoring in sociology and media studies, has developed his leadership and communication skills through the Bronze Leadership Challenge, UNCG Days of Service, as a Peer Leadership Educator, a Student Coordinator of Peer Education with the Office of Intercultural Engagement and attending LeaderShape institute. His leadership journey began in high school and continued through college with the Make a Difference (MAD) House Living Learning Community (LLC) and working with UNCG’s Office of Leadership and Service-Learning. “While in the MAD House, I learned about social issues that were negatively impacting the overall quality of life for citizens in Greensboro,” Saunders said. Greensboro/High Point have a food hardship rate of 22.2 percent, according to the 2016 National, State and Local Index of Food Hardship from the Food Research and Action Center. Saunders’ goal is to continue his work in fighting homelessness and hunger in Greensboro by connecting with even more community partners in leveraging resources.